The Soledad Rally is being moved to Lake Piru see that tab on top. This is a tracked vehicle friendly event and they are hoping to see some tanks driving around the campground! Metal cleats will have to stay in the dirt campground. Rubber pads can go anywhere. Absolutely no live firearms are to be brought, displayed, mounted or carried at this event! Demil and replica only. You may be asked for a weapon check. In addition all vehicle mounted weapons MUST display a red or orange band on the muzzle to define it as a dummy weapon. Soledad Canyon Thousand Trails is just south of Acton CA off the 14 Fwy and just about 15 miles from Palmdale at 4700 Crown Valley Road. Acton has a couple nice family run resteraunts, fast food joints are at the exit off the 14fwy but Super stores and chain resteraunts are about 15 miles away in Palmdale co located with lot of hotels. The closest airport is Burbank. You must register a campsite with Richard Johnson and then he will give you information to call up Soledad Canyon Camp ground to pay for your site. Please do not call the camp ground without conacting the organizer so that we can track and plan properly. If you go direct to the campground without contacting the organizer you will not be entitled to the site number you picked out as it will likely have been assigned by the organizer to another attendee. You will be moved to an open site which you may not care for. We are reserved for camp ground C at Soldedad Canyon. There will not be anyone else camping in this area other than us. The sites are mostly large but a few are small. The area is hard packed river sand, all of it. No vehicles got stuck at all despite massive rain during 2018 event. Sites have 30 amp 120vac and water but do not have sewer. There are several sewer tank dumps on site to drive through and dump. There is an electrical adapter required to hook up 15amp 110vac that costs $5. Avilavle thurs-sun at the camp store. While the meet starts on Wednesday and continues through Saturday night, there is no mimium number of nights required this year. Public vistors, sellers and buyers- You must register at the front office when you arrive. There is a $10 fee per vehicle to enter the Soledad Campground. This is a corprate rule that we must follow for this event. Parking will be to the west side of our campground for all day vistors and sellers. 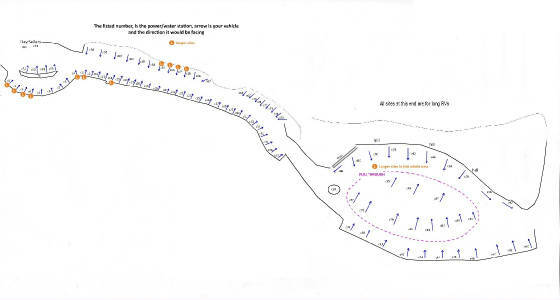 Trailer loading and parking will be on the very west end of the resort past the duck pond. 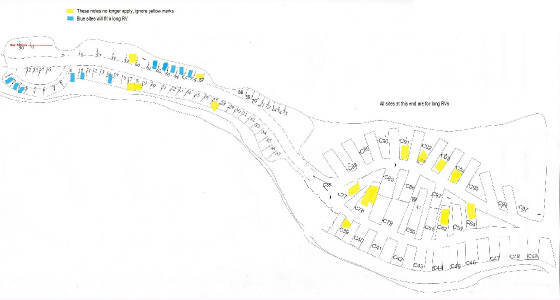 Below is the overall map of Soledad Canyon camp Ground. Campground C is our camp ground and Q is a possible overflow for us. Organizer Richard Johnson 0900hrs- 1900hrs 619-993-5284 7/days leave message if not answered. The list of available sites is at the bottom of the page and shows who is registered. 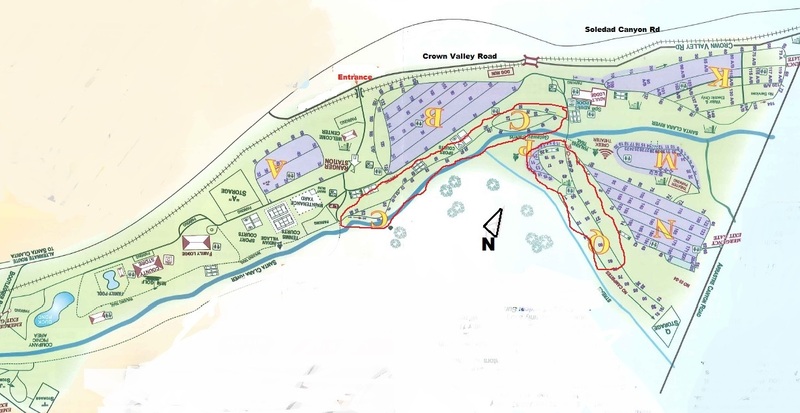 Below is the map of campground C where we will primarily be. Click on the map for a larger image and review to pick your site before you call the organizer. This map was drawn by Tom Hovis. Its a bit clearer than the above one provided by the resort. Day time visitor/ buyer not camping $10/vehicle per day, this is one fee that covers your truck and your MV you are towing in with you. If you are entering seperately on your own in your vehicle but camping with a friend in their site, you are required to pay the $10 daily fee each day.